Thalidomide, (RS)-2-(2,6-dioxopiperidin-3-yl)-1H-isoindole-1,3(2H)-dione shows, both in vitro and in vivo, a multitude of biological responses, the most prominent of which are inhibition of angiogenesis and of TNF-α (ATC-Code: L04AX02). The anti angiogenic properties are clearly linked to thalidomide’s teratogenicity. 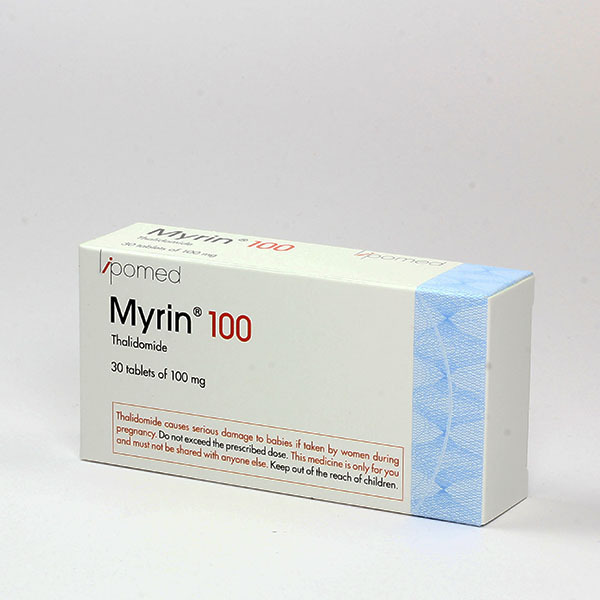 Myrin® is currently used in the treatment of cancer. If not prescribed and administered under strict control of a physician Myrin® can cause severe damage to newborns. Pregnant woman and woman capable of bearing children as well as procreative men are therefore not allowed to take Myrin® for any condition without a prescription from a physician. For further information, please contact LIPOMED. Copyright © Lipomed AG. All rights reserved.